If you're a manufacturer planning to ape Apple's popular MacBook Air design, you might want to reconsider copying the notebook's unique wedge shape. That's because a new U.S. patent, D661,296, was issued this week, which allows Apple to stake claim to the swanky design, and they've got detailed drawings to prove it. 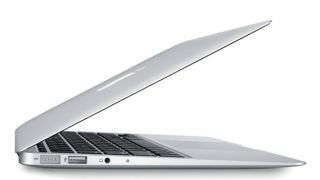 Manufacturers making Intel-powered Ultrabooks have routinely "borrowed" from the playbook of Apple's MacBook Air, and with good reason - since being overhauled in late 2010 and dropping in price, the teardrop-shaped computers have been flying off the shelves. Judging from Apple drawings revealed this week, competitors will have to stay on their toes to avoid raising the ire of the company's patent lawyers. Copycat Ultrabooks don't only have the unique wedge shape to fear: Certain types of hinges, feet or even the shape of the back could still fall victim to the wide-ranging patent. The real question is, will Apple use its newfound design patent as a club in the same way they've done with rival smartphone makers? Time will tell.